Bring your goal back to life by keeping the following tips in mind. Everyone loves a good leftover. Put away the grilled cheese and get out your festive fixins. Valentine's Day is approaching quickly, which means it's time to start stocking up on flowers, candy hearts and - of course - chocolate. Valentine's Day may fall on the same date each year, but that doesn't mean you're prepared for the big night. There's nothing more filling than a homemade chicken pot pie. Looking for a tasty dish to share with your significant other this Valentine's Day? As you're planning your Oscars menu, search for simple - yet visually pleasing - appetizers you can prepare and serve in your Crock-Pot® Hook Up® Connectable Entertaining System, which allows you to cook more than one dish at a time. Those leftover lasagna bits won't pair well with the beef stew you're planning to serve to your dinner guests. If one of your New Year's Resolutions is to start saving money on food, you're in luck - while the task may seem like an insurmountable feat, there are very simple steps you can take to ensure you don't end up spending a ridiculous amount of money on food this year. Looking for a tasty dessert to keep your friends warm as winter winds down? Opt for this delicious bread pudding recipe, which blends peaches, pecans and rich spices to form a scrumptious meal you won't be able to resist sharing. 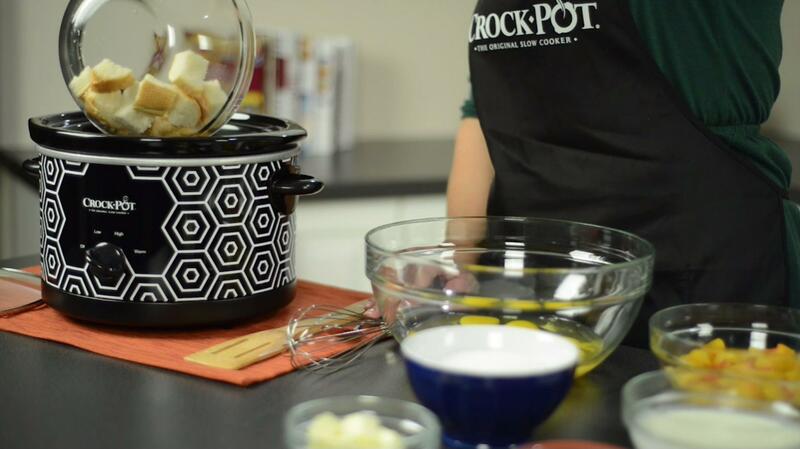 Crock-Pot® Cuisine is a new way for slow cooker aficionados to quickly prepare delicious dishes for the entire family. Make your mealtime a bit easier by following one of these steps, which can eliminate a lot of the hustle and bustle associated with dinner.